(3 Pack Deal) Mass Strike Tail Spin (Whopper Plopper) FAST SHIPPING!!!!! Savage Gear 3D BAT BD-90 Floating or Crawling Lure 4" 1oz Bat CHOOSE COLOR! 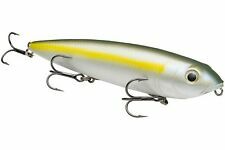 Moonshine Super Glow Lures Standard Series With VMC Hook CHOOSE YOUR COLOR!!! Type: Floating, Topwater Prop Bait. Color: CRACK SPAWN. All images are personal work.